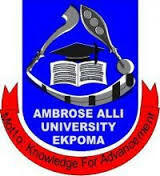 Ambrose Alli University (AAU), Ekpoma Post-UTME Admission Screening Results Successfully Uploaded Online for 2018/2019 Academic Session. Steps to Check AAU Post-UTME Screening Results Online. We are using this medium to inform all candidates that participated in the Ambrose Alli University (AAU), Ekpoma 2018/2019 Post UTME screening exercise that they can now log on to the university portal to check their results online.